New Zealand has a long and enviable record in conservation biology, which began with Wildlife Service efforts to save endemic birds from extinction by protecting them on offshore islands. This progressed to ecosystem restoration in mainland sanctuaries across the country but mostly on lands administered by the Department of Conservation. In the last two decades the research and practice of ecological restoration has expanded into degraded urban environments, which present a different set of constraints and opportunities. I will outline how my own research to understand vegetation pattern and process, and vegetation recovery after natural volcanic disturbance has evolved to provide a framework to understand how best to restore or reconstruct indigenous ecosystems in urban settings. Using examples from several cities around New Zealand, I will discuss the results of research underpinning community and council restoration planting and pest control efforts. I will also canvas how the new discipline of urban ecology can help engage urban dwellers (87% of our population) with environmental issues and reconnect people with nature to provide a more realistic chance of reversing the decline of New Zealand’s biodiversity. In brief, I will make the case for supporting community and council endeavours to bring nature back into cities as the new conservation frontier. The Charles Fleming Lectures are a memorial lecture associated with the Charles Fleming Award for environmental achievement. 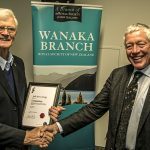 Professor Bruce Clarkson from the University of Waikato was awarded the most recent medal for his tireless work to advance and communicate understanding of native plant ecology and vegetation pattern and process, inform conservation efforts in terrestrial, freshwater and urban environments, and support effective on-the-ground restoration practice.